Happy Friday! I hope you have had a great week! We are gearing up for a busy weekend around here. Tonight, I am headed to my local J. Crew to pick out an outfit for an event I am hosting with them! If you are local, join me at the J. Crew at the Friendly Center in Greensboro, next Saturday, March 30 from 12pm-4pm. Come say hi and check out all of their new spring arrivals! Today, I'm sharing my weekly roundup of what I'm currently loving. The calendar now says spring so I am changing out my closet accordingly. I really love transitioning my wardrobe into a new season. It's so fun to mix pieces from different seasons to create something new! All of the pieces I'm sharing today would make great items to add a little spring refresh to your closet. 1. S H O R T S | I bought these shorts last spring and wore them multiple times a week last year! They are high rise and have the perfect amount of stretch. I would recommend sizing up one size for a more relaxed fit but if you like a slimmer look, stick with your regular size. 2. 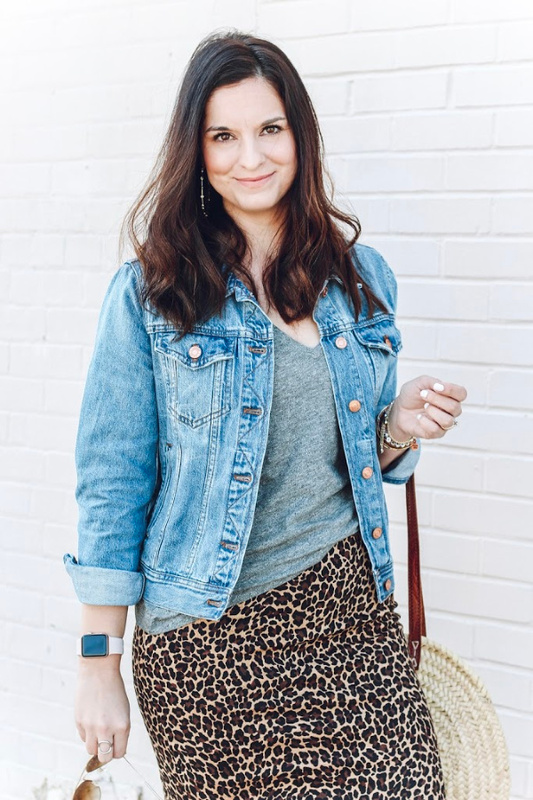 H E A D B A N D | I'm still loving all things leopard and headbands! Bad hair day? No worries. Just throw on a headband and no one will notice! This one is a great budget friendly option. 3. D R E S S | A little black t-shirt dress is a must have item. A closet staple for sure. Throw it on with a denim jacket and sandals for an easy, comfortable, and put together spring look! 4. S N E A K E R S | Want to add a little pizzazz to your casual outfit? Add pink sneakers! I have a super similar pair of New Balances and they are so comfortable. 5. B A G | How cute is this bag?! I love finding vintage inspired pieces like this. It would be a great neutral bag for spring and summer! 6. T E E | This gelato tee is calling my name! I need it to wear to my favorite local Italian restaurant that has the very best gelato. Who else loves some gelato? 7. E S P A D R I L L E S | I bought this pair of espadrilles two years (and I bought them in a second color last year) and I still love them! I have worn both pairs of mine so much and they are still in great shape. They are comfortable to walk in and the quality is great, too! I found the fit to be true to size. I love wearing mine with shorts, dresses, jeans, and skirts! 8. H A I R T I E | Besides headbands, I am really loving these hair ties. I have this same one in leopard print and I wear it so much. I add it to my top knot and either have the ties hanging down in the back or I wrap them around the front and tie them. I wear it to the gym pretty often because besides being adorable, it also helps my hair stay in place more securely. Thank you so much for visiting! I hope you have a great weekend!